The AI Ecosystem has generated a multi-billion dollar industry, and it all starts from data. Going upward in the value chain there are the Chips (GPUs) that allow the physical storing of Big Data (a dominant player is NVIDIA). That Big Data will need to be stored on platforms and infrastructures that SMEs can’t afford. That is where players like Google Cloud, Amazon AWS, IBM Cloud and Microsoft Azure come into rescue. At large scale, a few corporations control the Enterprise AI market; while nations like China, USA, Japan, Germany, UK, and France have widely bet on it! Beyond all the buzz and hype that comes with new words that enter the mainstream, AI is another of those disciplines that have become critical in today’s economic landscape. 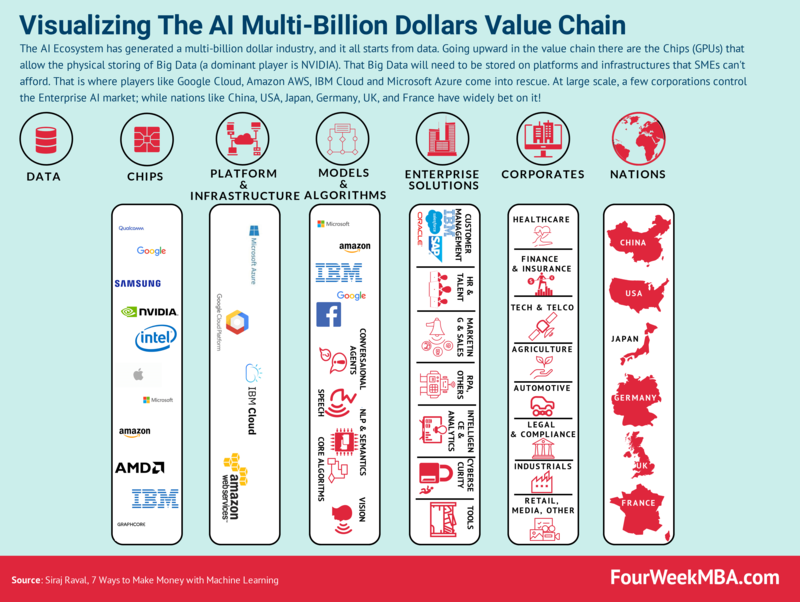 Far from being at an embryonic stage, the AI Ecosystem has become a multi-billion dollars enterprise, led by tech giants that go from IBM to Google, Microsoft, Amazon, and many others. That doesn’t mean there is no opportunity for new entrants. Quite the opposite. Let’s look more in-depth, into each of those key elements for an AI ecosystem. But before diving into it, we need to understand who and how is making money with AI. Who is making money with AI? As Siraj Raval points out, billions of dollars have been invested in the AI ecosystem, especially by large tech companies. This is a piece of good news, as those tech companies have created an ecosystem, which is out there, ready to be understood so that you can build your own company out of it. Indeed, understanding how this ecosystem works is the first step toward making money out of it. And it all starts with data! Keep in mind that the whole point of AI is to handle and actually being able to do something useful with a massive amount of data. In short, even though we like to talk about AI and machine learning, as they are technologies on their own sake. In reality, the foundation of those technologies is data. A curated data pipeline is the foundation for an AI ecosystem to work in the first place. Companies like Google, Wolfram Alpha, Amazon, and many others, spend billions on maintaining and curating its data. If at all, we can argue that for companies like Google, Data is its main asset. As already explained in the Blockchain Economy, in today’s economic world, built on digitalization, the rule is to keep that data proprietary. That made sense, as this data is what gets eventually monetized with several strategies. When Data reaches a critical mass, we can call it Big Data. There is no single definition of Big Data, and it might actually vary throughout the years. Given that the more the AI industry grows the cheaper data collection and processing will become. Which, in turn, will allow the management of a larger and larger amount of data. In the past, you could handle computational tasks with simple CPU. Until computers had to process a more substantial amount of data. This is where GPU came to rescue. A GPU or graphics processing unit is an electronic circuit able to manipulate a massive amount of data. Opposite to the traditional CPU, a GPU can process large blocks of data in parallel, which makes it quite suited for AI systems. Starting with a focus on PC graphics, NVIDIA invented the graphics processing unit, or GPU, to solve some of the most complex problems in computer science. We have extended our focus in recent years to the revolutionary field of artificial intelligence, or AI. Fueled by the sustained demand for better 3D graphics and the scale of the gaming market, NVIDIA has evolved the GPU into a computer brain at the intersection of virtual reality, or VR, high performance computing, or HPC, and AI. Its parallel processing capabilities, supported by up to thousands of computing cores, are essential to running deep learning algorithms. This form of AI, in which software writes itself by learning from data, can serve as the brain of computers, robots and self-driving cars that can perceive and understand the world. As of January 2018, NVIDIA recorded almost ten billion in revenues, and over eight billion came from the sales of GPU alone! Large tech companies, like IBM and Google, have been investing massive resources to get their GPU chips to process Big Data. To store a massive amount of data you need an infrastructure, that if you are small, but also medium business is tough to build. Therefore, you’ll need a third party able to store that data for you. This has led to the cloud war between Amazon AWS, Google Cloud Platform, Microsoft Azure and IBM Cloud. Amazon, Google, and Microsoft are the dominant players. Google, in particular, is using a smart business strategy, which in a way represents the way Google does it. Indeed, if you’re in programming, or operate in the machine learning field, you’re aware of Tensorflow, an open-source machine learning library. Google leverages on the open-source model as it allows anyone to use this library, which makes it better over-time. But it also makes for the need for the larger and larger amount of data to be stored. And guess what, Google has a product for that: Google Cloud Platform. Therefore, if you’re a programmer using Tensorflow, and you need a platform to store that data, chances are you’ll use Google Cloud infrastructure. Both the enterprise and corporates AI industries are dominated by huge players that over the years have built massive infrastructure for large enterprise clients (take Salesforce and Oracle in the customer management industry). At the same time, nations are investing in AI to generate long-lasting economic growth. China, USA, Japan, France, UK, and Germany are all investing in AI. Let’s look at how, you can make money, instead, with AI. How do you make money with AI? Next Next post: What Is Brand Value And Does It Matter?